Dry Rot attack. Just how hard is it to treat? 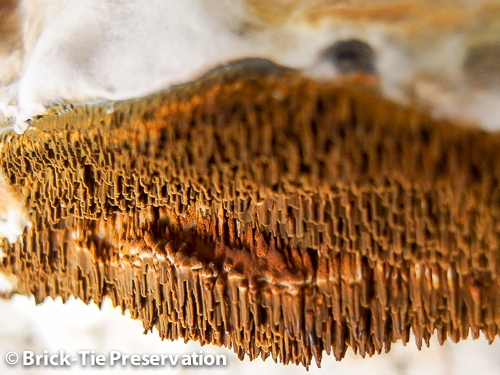 We get lots of calls from clients worried about dry rot treatment following a dry rot attack. Usually this follows a survey which has suggested dry rot Serpula lacrymans is present in their house, often the survey report will carry dire warnings about the dry rot, resulting in worried homeowners. Dry can be found in houses across the North and we’ve been involved in treating Dry Rot attacks in Leeds, Ripon, Skipton, Sheffield and Huddersfield too. It’s true that in the past Dry Rot tended to be over-treated, with hundreds of gallons of powerful fungicides pumped into walls to try to kill it off. Prior to that, walls were sometime coated with fungicidal plaster and even blow torches were used to burn walls in an attempt to incinerate the fungus. Lots has changed in the past few decades and now, dry rot is treated with much less chemicals and there’s much less disruption. Strict health and safety rules mean that much more care is taken, especially where CHAS accredited and Property Care Association members are like us are involved. For starters most dry rot; mentioned in reports, turns out not to be dry rot at all; there are a few relatively harmless wet rots and other fungi, which can be mistaken for the True Dry Rot. In addition, any dry rot found in a domestic or commercial dwelling must be caused by something; a leak; ingress or water or damp from another source. It’s crucial that the cause is identified as early as possible, so that the repairs and treatment are successful and not wasteful. An experienced surveyor, preferably with local knowledge is needed – housing differs from say Rotherham to Dewsbury – Selby to Bradford – it pays to use a Yorkshire based firm. This is where the qualified timber infestation surveyor (CSRT), like our surveyors comes in too. He will be familiar with a wide range of wood rots, so will identify the infestation correctly. He’ll then find the cause and design a treatment and repair solution specifically for the outbreak; rather than just throwing a standard treatment at it, which may not work or may cost much more than is really required. The main point is moisture. Without this all dry rot will die, so locating and repairing the moisture source is vital. It could be something as simple as a gutter leak, or a more complex problem such as rising damp or penetrating damp. The exposed houses near the Peak district, Yorkshire dales and Ilkley Moor get lots of wind driven rain. Houses down in the valleys near Leeds and and Bradford suffer more rising damp and in hilly Sheffield conditions vary from one district to the next, so surveyors need to keep an open mind at all time where damp diagnosis and decay is concerned..
Our Yorkshire based surveyors are experienced and CSRT qualified. If you need any advice on Dry Rot, or wish to book a survey call 0800 591 541 for details.